Ready to step up your game, but not quite ready for the Pro's? Look no further than the Pro Am II! A classic sport style shoe accented with precise hand stitched lines. 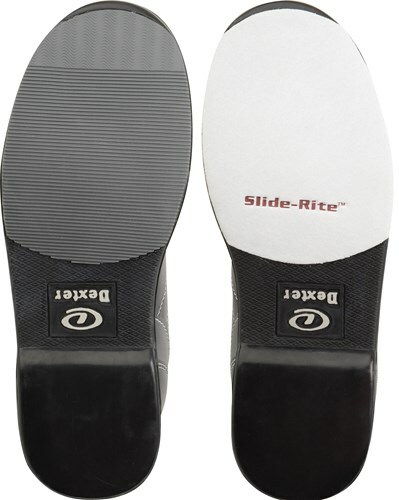 Get a better push off with a traction sole on the right shoe and slide sole on the left shoe. These are comfortable shoes and affordable. They are slippery after about a week of solid use. The rubber picks up all the dirt and particles so cleaning them before each throw is recommended. If somebody spills water or you find a wet spot might as well trade the shoes out until they dry completely. I would recommend thus far. I throw a hook ball: Roto Grip Critical Theory and Psycho Raw Hammer. Best of luck to who ever purchases these awesome shoes. I also have plantar fasciitis and these seem to support my arch pretty good without inserts. By Sam from Los Angeles, CA. Pro performance at a reasonable price!!! I bowl at least twice a week between league and practice, my buddies were telling me I need a shoe with a traction sole for more consistency, boy were they right! Pro performance at a reasonable price... I was way more consistent at the line. True to size I went 1/2 size over as in my last Dexter's these have more room but i don't mind. I'm never going back to dual slide. 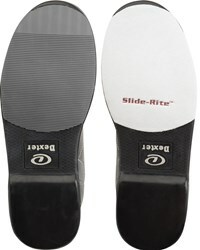 Fixed slide sole and fixed traction sole not interchangeable. These shoes are a great step up from universal bowling shoes. If you plan on traveling to tournaments or various leagues in different alleys, I would recommend getting shoes that have interchangeable soles and heels. But if you're just looking for a basic shoe that is a step up from universal shoes, you won't have any complaints about these ones. They're very comfortable and feel more like bowling shoes whereas universal shoes feel like glorified sneakers. The traction shoe may take a couple of games to get used to, but if you hang in there, it will help increase your speed on the ball and after awhile, you'll forget that you have a traction shoe. Before these shoes, I was averaging about 15.6 - 15.9 mph on my ball speed and after a few games with these shoes, my speed went up to 15.9 - 16.2 mph. It may not seem like a big difference, but any serious bowler knows otherwise. What happens is the traction shoe allows the bowler to get a better push off on their approach, which adds to your ball speed. Another plus about having a traction shoe is that it helps with your balance since you won't have a slide sole on your push off foot. You'll feel more secure and balanced with these shoes. I would highly recommend these shoes to anyone, especially since they're available at a great price. Im a righty but my left, non-slide shoe, has totally fallen apart(sole is coming apart, toe is worn almost through) in less than 6months. I know these aren't supposed to be the greatest shoes, but they should last through a year. Great Bowling shoe for the Money! For the money this is a good right handed bowlers shoe. I like a shoe with a slide on only the left shoe and this shoe does it for well under $100. By None from CANTON GEORGIA, Cherokee Lanes. I liked this shoe, TILL IT SPLIT ACCROSS THE SOLE IN THE CENTER OF THIS LEFT SHOE. Good shoe, but they are the only shoes I have owned that have left scuff marks on the lane. Took a chance on this shoe and turned out as described. Fits well, looks well, and comfortable. Would purchase again. Time will tell as far as durability. I advise when you buy these shoes get some easy slide. 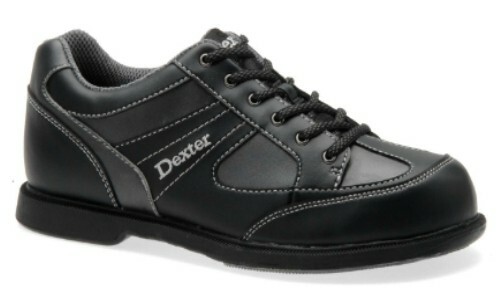 Satusfaction of purchase of Dexter Bowling Shoes. I'm very satisfied with these shoes, the price, and the efficiency of the company to get the product to me. Needed Size 14 for my son. Great Purchase! Is this sole on the slide shoe interchangeable? No, this shoe has a fixed S8 sole on the slide foot. If you're not someone who slides, would this shoe still work just as well? Hello Suzanne! That's a bit of a tough question to answer specifically because I don't know exactly how you bowl. This shoe will have a slide sole on the left foot and a traction sole on the right. You might want to look into getting a rental shoe or at least a shoe with universal soles (slide soles on both feet) if you don't use the traditional bowling technique. Does shoe come in left hand configuration? Can I order replacement slide soles? Is this something I could do myself? When buying shoes when they ask left or right hand they mean what hand u bowl with? Unfortunately, the sliders are permanent and cannot be interchanged. How true is the size compared to my dress shoes? Due to the time it takes to produce the Dexter Mens Pro Am II Right Hand ball it will ship in immediately. We cannot ship this ball outside the United States.